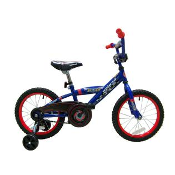 Little riders will have fun on our 16" training bicycle. It features a padded handlebar and double-guard chain for safety. Good for ages 3-6. Colors and styles may vary. Helmet not included.